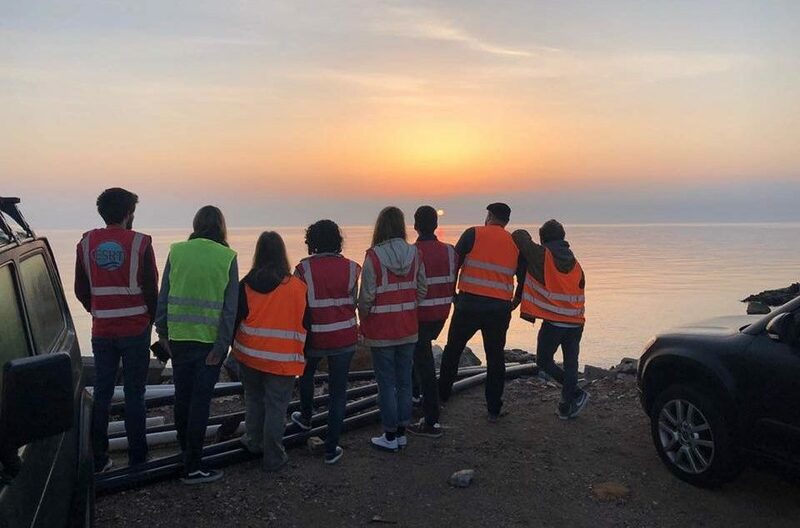 CESRT is a locally organised team of international volunteers dedicated to providing support for both refugees and for local people on Chios. The story of CESRT started in the autumn of 2015 at Megas Limnionas when local hotel (Sun Rooms) owner Toula Kitromilidi heard the cries of children on the nearby beach. 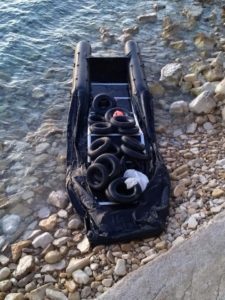 A boatload of refugees had landed outside her home. She brought the people to her rooms and provided clothes, food, water as well as shelter. She later made a facebook post about it and met through it two people: Caspar Thomale and Eleni Boubousis. Caspar Thomale set up a meeting of local groups who were helping boats to land. At the meeting Toula took on the role of a contact person. A week later Eleni Boubousis, set up a facebook page for the team, further opened the door to recruitment of international volunteers and donors. 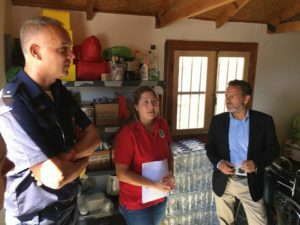 After two months Toula took the decision to establish CESRT, the Chios Eastern Shore Response Team. A facebook page was set up and volunteers continued to arrive. From early on Toula expressed her interest that decisions should be shared, and the group operated by consensus. In these days before March 2016, arriving refugees were simply registered and sent on to Athens, and from there to other countries in Europe. During the winter of 2015-2016, boats arrived in numbers not seen since. There could be as many as 20 boats in a 24-hour period. (The highest number in a day was 32 boats.) Volunteers worked 4-hour shifts, patrolling the coast and maintaining a lookout for boats. The warehouse was the basement of Sun Rooms, from which CESRT provided supplies not only for our team but also for four other local teams. Wet clothes left on the beaches by asylum seekers were collected, dried across the lane from Sun Rooms upstairs in an open-air floor, washed at the ‘Laundry House’, and then dried again in the drying space. These clothes were then sorted into ‘carstock’ and used to help at new landings. In the early days the registration point was in Chios, called Tabakika, where the team distributed milk, clothes, tea, and fruits from local orchards. With the establishment of the EU-Turkey Deal of March 2016, refugees were required to seek asylum in the first European country in which they arrived. This suddenly put the onus on Greece to deal with the great numbers of arrivals on the Greek islands of Chios, Lesvos, Samos, Kos and Leros. The movement of people through Greece slowed to a trickle and camps appeared on all the five islands as well as the mainland of Greece. The people are detained for months and even years while their claims for asylum are being processed. In Chios, camps appeared at the new Vial registration point, as well as at Dipethe near the central garden in Chios, and Souda near the old castle. With the appearance of the camps, CESRT began various other programs including distributions. A ‘boutique’ container, where registrants could get two items of clothing for each of their family members once or twice a month, was kept stocked and staffed near Souda camp. Unfortunately, the Souda boutique was burned down in a fire, and permission was never granted to replace it. Also, the team took initial responsibility for feeding, clothing and providing basic education/activities for unaccompanied minors before Save the Children took over. 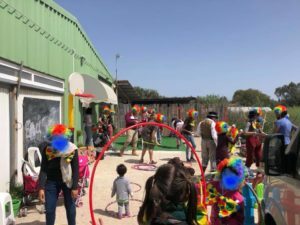 CESRT worked with various other volunteer efforts on the island, including The People’s Street Kitchen and Zaporeak kitchen, which both provided up to 1500 meals daily to Souda camp. SMH also partnered with CESRT, first as a sea rescue team and later as the medical team present at all landings. Liaisons were maintained with all the organisations on the ground, of which many have come and gone. Early CESRT volunteer, Nick Millet established a school for refugee children (Be Aware and Share, later Action for Education). Another volunteer, Gabby, established the Women’s Centre (later Action for Women). Both of these became independent NGO projects. In the fall of 2016, CESRT volunteers began teaching English in the central garden of Chios. Later this effort became The Language Centre, which remains a part of CESRT. All the while the landings continued, and cooperation with local authorities led to a protocol for landings in which the provision of food, water, and dry clothes were included—provided by CESRT under the auspices of the various medical teams which attended, and now under the auspices of Offene Arme e.V., itself a registered NGO. CESRT is the only team that has been present at landings for all three years of this crisis. Literally thousands of volunteers have rotated through this team and served ‘on call’ for landings 24/7. Their training on the ground and perseverance as a team has earned the respect of local authorities. Perhaps nothing indicates the growth of the team better than the change in ‘carstock’—the food, water & clothing items carried in cars for beach landings. Initially the total amount of carstock fit into one car. As of this writing it takes three cars to transport carstock for one landing. This is because in addition to food and water, we now provide a full set of clothes and blankets for each arriving person, as it needs a long time until they receive clothes in the camp. Stocks of clothes, toiletries, and hygiene kits have arrived by donation from all over the world. And consequently, the warehouse moved from the basement of Sunrooms to a beach building in Karfas, to a large hanger-like building near Thymiana, back to Karfas, and eventually to its current home in Thymiana. Sorting, re-sorting, packing, stocking and re-stocking clothes has been an ongoing mammoth task that every volunteer for CESRT has spent hours doing. And the payoff is a landing or distribution where a refugee or asylum seeker has been given a fresh dry set of clothes, the hope and care of human face-to-face contact and a need fulfilled. Other projects undertaken by CESRT are games with children in Vial, tea distribution in cold months for camp residents, beach cleaning after landings, and a Parents and Toddlers House where children could get a hot shower and a change of clothes, toiletries and a safe, clean place to play. Some of these projects come and go with seasons, capacity of the team, or the vagaries of political and economic context. But always the team has stepped up whenever possible, to fill a gap where needed, and provide humanitarian aid to people in a distressed situation. 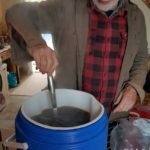 From emergency accommodation to winter-time tea distribution to camp residents. Aid has also been provided to local islanders who are in need. CESRT operas a used clothing free store twice a week for locals and has also helped cook meals for local people in need. There has been regular lasting support from organisations across the world—click here for a list of our funding partners—support has been invaluable to CESRT as well as ensuring that the situation continues to be in the public eye. It must be said that the team has managed an incredible response over the past three years, despite the fact that most of the team is made up of short-term self-funded volunteers, able to stay for perhaps three weeks or one month at a time. There are also long-term self-funded volunteers, who make a commitment to stay for a number of months, some coming back to log in over a year of service. In fact, there have been over 2,000 volunteers in the team to date. But the number-one volunteer, the only one who doesn’t get to leave the island to go home—as Chios is her home—is Toula, the heart and soul of the team. Her untiring efforts with local authorities, leaders, and other actors on the island, her care and protection of volunteers, and her empathy for people on their journey for asylum, peace and liberty, have provided the team with consistency and relevance of response. As a result, this multi-national team of dedicated volunteers has provided since 2015, and continues to provide, support to and solidarity with asylum seekers—from the moment they land, until they move on in their passage.